French President Francois Hollande has vetoed the delivery of two Mistral helicopter carriers to Russia, citing “the current situation in eastern Ukraine.” Although the halt does not represent a final decision, military experts believe that Russia will never see the ships. An international arbitration court will review the issue of compensation, which may be less than Moscow thinks. 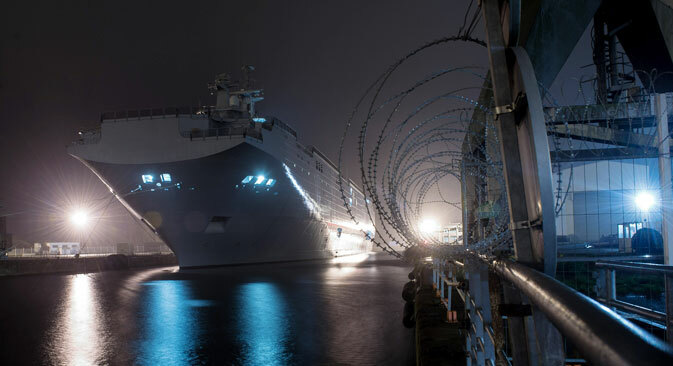 French President Francois Hollande has announced that the dispatch of the first of two Mistral helicopter carriers built under contract for Russia has been postponed indefinitely, raising the prospect that Moscow may never actually see the ships. On Tuesday, Nov. 25, Agence France-Presse cited Hollande as saying that he was halting the delivery of the already constructed Vladivostok ship to Russia in connection with a lack of improvement in conditions in eastern Ukraine, where Moscow is perceived to be actively supporting pro-autonomy militants. The ships will not receive an export license for military production, without which they cannot be delivered to Russia. According to the contract, signed by then Presidents Dmitry Medvedev and Nicolas Sarkozy, France was supposed to construct two warships for Russia by the names of Vladivostok and Sevastopol under a contract worth 1.2 billion euros. NATO representatives, as well as influential American congressmen, were against the delivery of the Mistral, since, in their view, Moscow is guilty of escalating the conflict in Ukraine. NATO also considered purchasing the ship, but then realized that it was impossible, since the ship is adapted specifically to Russia's military needs. In the event France does not respect the contract, it may have to pay a fine of almost 3 billion euros, according to experts surveyed by the Parisien newspaper, writes RIA Novosti. A RIA Novosti source in diplomatic circles believes that besides the cost of the contract, 1.2 billion euros, Russia may be entitled to additional compensation in the amount of almost 800 million euros for each of the two Mistrals. Russian Deputy Defense Minister Yury Borisov announced that Moscow is willing "to wait patiently," but may eventually file a lawsuit with the Arbitration Institute of Stockholm. For now it is not clear whether the court would judge the Ukrainian crisis as a force majeure that gives Paris the right to reconsider the deal. Professor of International Law at Moscow State Institute of International Relations Ilya Rachkov explained that the force majeure clause would go into effect only if there was a military conflict in France. The contract to deliver two Mistral helicopter carriers, signed by the French DCNS and the Russian Rosoboronexport in 2011, became the first large armament contract between Russia and NATO. The first ship was supposed to join the Russian Navy at the end of 2014, the second in 2015. Rachkov mentioned the time Russian President Dmitry Medvedev had vetoed the delivery of the S-300 surface-to-air missile systems to Iran because of a UN Security Council Resolution, after which Tehran filed a lawsuit with the Geneva International Court against Rosoboronexport, the producer of the missiles. In the opinion of military expert and editor-in-chief of the Yezhenedelny Zhurnal online publication Alexander Goltz, Hollande's decision essentially means that "the ships will never be delivered to Russia." "Their delivery is related to Russia's cardinal change of positions towards Ukraine," says Goltz. "It is clear that in the foreseeable future Russia will not change its approach and therefore no conditions for the delivery of the Mistrals will be created." According to Goltz, "Russian experts and mass media highly exaggerate the volume of the fines and penalties. The deal was definitely insured and reinsured. France certainly will have some costs. But they won't be so extreme." Meanwhile, if France does not respect the contract, it could have an impact on the country's reputation as a large player on the armaments market, as well as on its relations with Russia. Former French President Nicolas Sarkozy is responsible for the Mistrals' delivery. In mid-November he said that France must "keep its word" and deliver the ships. In turn, Alexei Pushkov, director of the State Duma Foreign Affairs Committee, told RIA Novosti that by halting, but not completely terminating, the Mistrals deal, France is "trying to find" a balance between its membership in the EU and NATO and its relations with Russia. Pushkov considers the French president's decision to be "temporary and half-hearted." "France will have to decide in one direction or another. However, perhaps the French president thinks that sooner or later conditions for the delivery will improve." If the Mistrals are not delivered, it will not be the first failure related to Russia ordering a military ship from the West. In 1937 the Soviet government tried to order a powerful battleship from the U.S. Although Soviet diplomats were able to meet and discuss the issue with American President Franklin D. Roosevelt, they could not come to an agreement. The U.S. proposed to build a warship of an older model, but the Soviet military declined the offer.